I wish to emphasize that the process we are discussing was not linear, but organic and dynamic. One idea brought with it a complex of other ideas and fairly quickly you get a new mosaic or collage of images and explanations developing around one figure. As the first Christian Jews were trying to sort out Jesus' death, this sorting had real implications for how they recalled and came to understand his life and teachings. Whether the manner in which they framed his ministry as the Prophet-like-Moses was actually how his ministry played out is doubtful, but there were likely bits and pieces of Jesus' life that they saw corresponded enough with the expectations of the Prophet-like-Moses mentioned in Deuteronomy 18:15-16 that this framing made sense to them. In other words, if Jesus himself didn't present himself as some kind of prophet, his very earliest followers did because it is multiply-attested in all the layers of the tradition. Clearly his followers didn't identify him with any ol' prophet. They hooked him into the traditions of the Prophet-like-Moses, who was a messianic figure within Judaism and especially Samaritanism. The idea was that during the last days the prophet would come to restore God's law to its original intent, and this would prepare the faithful for the final Judgment. So we find stories of Jesus' baptism where the Spirit anoints him just as other prophets were anointed in the past (Wis. Sol. 7:27). For our upcoming discussion, it will be important to note that Mark portrays Jesus as a fully human being, whose soul has been augmented by the Spirit of God when he was possessed with the Spirit at his baptism. The other very important factor here is that the Moses traditions were part of a larger complex of traditions in which the Jews were discussing their heroes as figures so righteous and loved by God that they were believed to be exalted and transfigured (i.e. Enoch, Jacob, Moses, etc). The Moses traditions are quite fascinating because Moses is given such an exalted status in heaven that he is pictured enthroned (on God's throne!) as God's viceroy and mediator. In Samaritan traditions, Moses is so exalted and glorified that he is even given God's divine Name. It is this willingness to exalt heroes, to enthrone them, to invest them with the divine Name, that helps us explain how and why Jesus gets associated with the divine Name too. Very early in the tradition, we have the confession "Jesus is Lord" which means "Jesus is YHWH" (i.e. 1 Cor 12:3; Phil 2:9-11; Rev 17:14; 19:16; Acts 2:38). Like any other idea, once the Name is associated with Jesus, so too is a number of other traditional complexes which I will discuss in an upcoming post. I am interested in the language you just used of "investiture with Divine Name," particularly the word "investiture," since this is primarily a priestly term (although we could also use it with other offices). Is this to say that whenever the earliest sources say "Jesus is LORD" they are making a connection with the high priest (who had the tetragrammaton, quite literally invested with the divine name)? Or does the use of LORD only sometimes have priestly allusions, while other times not? I wonder whether the Prophet-like-Moses is the best point of departure for discussion on Jesus. While Matthew certainly presents Jesus as a new Moses, this theme, at least as far as I know, does not dominate the earliest sources. However, we do find strong connections with Q 7.22-23 and 4Q521, both of which have a figure doing mighty works, including giving sight to the blind, raising the dead, and proclaiming good news to the poor. In 4Q521, though its debated, I think a strong case can be made that these works are performed by the God of Israel through his messiah. This is the same picture we see in Luke 7.22-23. The trouble I have with starting with the Prophet-like-Moses is that it is difficult to get from Isa 61.1-2 (in Luke 4.18-20; 11QMelchizedek; 4Q521) back to Deut 18:15-16 through Wirkungsgeschichte (reception-history), at least as far as I know. One more thing: I think that it is highly significant that the Son of Man in the Parables of Enoch is also invested with the divine name and shares the throne of God (the Lord of Spirits) (cf 1 En 37-71). To my thinking, this would suggest that Enochian Judaism is a great place to start looking for early Christological conceptions. Michael makes a good point about early messianic and Son of Man traditions being very important to early Christology, but I also find your argument that the "Prophet-like Moses" to be interesting. It seems that especially John and Acts make this identification: John the Baptist denies he is "the prophet" (John 1:22) and the crowds acclaim Jesus as such (6:14; 7:40) and the speeches in Acts make explicit that Jesus fulfills the Prophet-like Moses (Acts 3:22-23; 7:37). Although these are late sources, I guess you would suggest that they are here preserving very old tradition? Great series by the way, lots of food for thought. I realize that John is later than Paul and maybe even Revelation but I hope you get around to the I Am statements in John. Even in Jude, James, and the letters of Paul, or 1 Clement? And why were Christians not stoned to death as blaspheming idolators for proclaiming that a recently executed criminal was YHWH? Steven: On "multiple-attestation," this term is usually reserved for the earliest sources we have (specially the sources behind the NT or the NT itself). One does not need to find a tradition or saying in 5 or 10 sources for there to be "multiple attestation." Usually only two or three will do the trick. As for your other question: I think that it is generally accepted as fact that the earliest Christians were heavily persecuted by both the Jews and Romans for their worship of Jesus. One could look at statements in Matthew, Revelation, 2 Peter, 1 Thessalonians, and Acts. Even if Matthew and Acts are not taken as historically reliable in the particulars, they should be scene as at least representative of the perception of the early church with regard to matters of persecution. As for your other question: I think that it is generally accepted as fact that the earliest Christians were heavily persecuted by both the Jews and Romans for their worship of Jesus. According to Acts , the Romans had no idea who Jesus was, and the Jews never thought of telling the Romans that these Christians were allegedly worshipping a recently executed Messianic candidate, who was claimed to be still alive and leading the movement. Paul in Romans 13 has absolutely no idea that the Romans are persecuting Christians. Paul says in Galatians 6 that Christians were persecuted on the issue of circumcision. He also claims Christians avoided persecution by compromising on the issue of circumcision. I'm sure they were persecuted on the issue of circumcision, but they would have been killed as blaspheming idolators the minute they said that a recently executed criminal was the Jewish God that should be worshipped. One does not need to find a tradition or saying in 5 or 10 sources for there to be "multiple attestation." Usually only two or three will do the trick. And if the earliest sources, the ones which make the most systematic attempts at developing a theology , just have no concept of these 'multiply attested' things? Just how 'multiply attested' is the shooting of JFK by a second gunman? CARR: Regarding you last point, I don't think that any of the documents we have in the NT are attempts at systematically presenting theology. I suspect you are thinking specifically of Romans, and I believe that Romans is a highly situational letter driven by a desire to correct Jew/Gentile relations, rather than a ST. But, even if we look at Romans, we see Paul presenting Jesus as a messiah and as sharing in the identity of the God of Israel. In Rom 1.3-4, Jesus is portrayed as sharing in the Davidic blood line, which fits some messianic conceptions of the period (see Pss Sol 17-18). We also see him presented as the "Son of God," which is also a Jewish title for a messiah (see 4Q246). In Rom 3, we see Jesus as the one who reveals the righteousness of God apart from the Law. In 1 En 37-71, the Son of Man also reveals secrets and shows no concern for the law. This is in keeping with the idea that God's intermediary would be a revealer of secrets. In Rom 10.9-13, Jesus shares in the identity of the God of Israel (e.g. "All who call on the name of the Lord will be saved." Contextually the Lord is both the God of Israel and Jesus. One other issue comes to mind, Jesus is referred to as Jesus CHRIST (or CHRIST Jesus) no less than 29 times in Romans and 14 times in Galatians. If Jesus is not conceived of a messiah exceedingly early on in the Christian movement, we are at a loss for an adequate explanation for how the Greek title for messiah (Christ) becomes part of his name in the early letters attributed to Paul. In other words, Jesus needs to be thought to be the messiah early enough to explain why his earliest followers add the title to his name. He is no longer Jesus of Nazareth; He is Jesus Christ. Romans is a systematic work of theology, about the impact of Jesus on the relationship between Jew, Gentile, the Law, faith and salvation. But Paul uses not quote from his Lord and Saviour ijn his arguments about how faith has changed things. Paul does refer to the Christ, but never to Jesus of Nazareth. Paul does indeed write that Jesus was descended from the seed of David according to the flesh. Which is at least a very strange way of writing. And Paul writes in Romans 16 that Jesus has now been revealed through the scriptures. But the earliest sources do not have Jesus of Nazareth. They have Jesus Christ. And Paul never explains why Jesus was the Christ, or what Jesus did which made him the Christ. What advantage, then, is there in being a Jew, or what value is there in circumcision? 2Much in every way! First of all, they have been entrusted with the very words of God. Well, some people would argue that not only had Jews been entrusted with scripture, but Jesus Himself had gone to Jerusalem and preached to Jews. And having the Son of God living in their midst , teaching and preaching, could also be seen as an advantage the Jews had had by certain people, perhaps just as much an advantage as having been entrusted with the Hebrew Scriptures. Carr: I'm not as convinced as you are that Romans is a systematic presentation. Here I follow Bob Jewett in his Hermeneia volume on the book. I think you have brought up an interesting point, namely, that Paul does not go to great lengths to discuss the "how" of Jesus as messiah, but merely assumes it. I'm actually in more or less agreement here, though I do think that Paul offers some explanations along the way. However, I believe you are correct that it is not Paul's focus. This, I believe, only strengthens my point that Jesus is conceived of as messiah from very early on. Thus, the "how" is not necessarily on Paul's mind, it is just taken for granted. As for the earliest sources not having Jesus as "Jesus of Nazareth," Q is replete with references to Jesus apart from "Christ." I cannot stress enough the contextualized nature of the documents we now call the New Testament. We are listening in on an ancient conversation far more than we are reading an ancient systematic theology. Thus, the "how" is not necessarily on Paul's mind, it is just taken for granted. So where are the explanations in the earliest sources of how a crucified person could defy all expectations and be the Mesiah, when it is just taken for granted that he was? The Law and the Prophets testified to this righteousness from God, which has been made known. Didn't Jesus do *any* testifying about this righteousness from God? I think you have hit the crux here. For my part, I think there is ample evidence that Jesus actions were taken as messianic by his first followers. See his response to John the Baptizer's disciples in Q 7.22-23 (or Luke 7.22-23 and par. if you like : ) . We have a close parallel in 4Q521, which suggests that the messianic age would be accompanied by God giving sight to the blind, raising the dead, and preaching good news to the poor through his messiah. This fragment from the Scrolls is admittedly difficult to understand and is highly debated, but I think the parallels are strong enough to admit it for relevance to the study of Jesus and the gospel materials. I think the best explanation for the rise of the messianic designation of Jesus is that there was some impulse, something about him or his actions, that urged his first followers to overlook any expectations they may or may not have had and to consider that he might in fact be the messiah, even if a crucified one. When they did this, the went back to their scriptures and did a bit of midrash, reading the texts through the lens of their crucified messiah. Then, they found what they were looking for. In other words, I believe that there is reason enough (e.g. Lk 7.22-23) to conclude that messianic conceptions of Jesus began with how he was remembered by his first followers. Why as late as 1 Clement did Christian writers leave out any association of Jesus with John the Baptist? Were Christians like Paul and the writer of 1 Clement so embarrassed at the idea of Jesus being baptised by John the Baptist, that they airbrushed out his association with Jesus? As far as 1 Clem 17.1 goes, it may just be because Clement is discussing what OT says that he does not discuss the Baptizer. One thing the evidence will not allow, I believe, is the conclusion that Paul and others were embarrassed by Jesus' association with John the Baptizer. Note the sections that I put in bold. Ignatius has no trouble affirmed a divine Jesus who was baptized by John to fulfill all righteousness. I think we can take certain aspects of gospel teachings about Jesus behavior at face value (I mean, as reflecting his actual practice during his lifetime). These would include): 1) healing the sick, 2) forgiving sins, 3) performing exorcisms, 4)practicing open commensality (dining with "sinners"--showing a willingness to shirk some aspects of ritual purity in order to reach out to marginal others with his message). In these actions, and perhaps in his prayers, as he called God "Father," he--how did the gospels phrase it?--spoke (and acted) "as one with authority, and not as the scribes." (At the same time, he held to some important practices of an observant Jew (keeping the feasts, the Passover, reading in the synagogue, going to the Temple, advocating offerings to the Temple and priests). Had he not been crucified, he might have simply gone down in history as a reforming Rabbi, a leader of a school, such as Shammai, Hillel, Gamaliel, or Yohanan ben Zakkai. 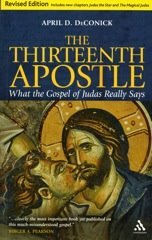 For example, in his article on the woman caught in adultery, Dr. Alan Watson does an interesting job of peeling back the layers of the gospels' Christologizing, instead situating the debate over the woman caught in adultery within debates about marriage and divorce laws in the Judaism of Jesus' day. Seen in this way, Jesus is just another Rabbi with a legal opinion. The crucifixion polarized and crystalized everything. It forced both his supporter and detractors to reflect on his legacy and take a clear (and significantly evolved) position on who and what he was. Those convinced that Jesus had died and innocent man were forced to search for a meaning for this, and after some effort found it in the scriptures and the Maccabean ideas about righteous martyrs bringing atonement that Dr. DeConick has already alluded to. Some of those who had not supported him, logically, reached the opposite conclusion--that Jesus had deserved his death--and created their own stories to back that up, as recorded in the Talmud. I think it seems quite likely that the roots of the investiture of Jesus with the divine NAME by his followers was rooted in the actions (and possibly even sayings) of Jesus himself. Although we cannot be sure exactly how it was done (exactly what words were used), it seems likely that Jesus invoked YHWH in his prayers of healing, exorcism, forgiving of sins, and other such acts attributed to him. Moses is probably the most important figure in Jewish history that contributed to ideas about the Messiah. The dream of a Messiah is in a way a hope that some day a leader as great as Moses will come. He is the model for the Messiah. However, no matter how exalted Moses or any Messiah figure would be, a more important part of Jewish tradition is that they are all human — which means you can argue with them and dispute them when you think they are wrong. In Jewish tradition, even God is not above this kind of debate. God welcomes a good argument. And if you can disagree with God, you can certainly disagree with any human ruler, including the Messiah. The Pharisees and rabbis developed the idea that no one is greater than the Constitution, the Torah. They fought for constitutional government. They believed this is what God wanted — for human beings to debate the Constitution and not consult the divine everytime they ahd a problem. So any ideas about the Messiah or Moses' exalted status take second place to the Constitution. That has to be remembered or discussion about Messiah beliefs in Judaism get skewed. I have to add one point in disagreement with Liam's comment about some Jews believing Jesus deserved to be crucified and that this was preserved in the Talmud. The very sparse references to Jesus in the Talmud are not a response to any historical situation in Jesus' time. They are a response many centuries later to what they heard Christians saying about Jesus and his death. They are responding to Christian gossip, you might say. Once Jesus was on the road to being deified by gentiles, rabbinic tradition broke off any attempt to record an independent memory of these events. If the clues in the Gospels tell us anything, it would be the favorable place Jesus occupied among Jews, virtually all Jews. No Jew of the time would have thought Jesus deserved to die. He was another victim of Roman cruelty whom his fellow Jews would have saved if they could have. Nobody deserved to be a victim of Roman cruelty. To suggest that some or many Jews thought otherwise is a calumny against ancient Jewish culture. And why would Clement discuss the OT so exclusively when his heart was bursting with the news that his Lord and Saviour had undertaken the same baptism that rank and file Christians had? And this his Lord and Saviour had put JtB right up there with Elijah? And were his readers not going to be puzzled by Clement talking about people in goatskins and sheepskins prophesying the coming of the Messiah when JtB had done exactly that just a few decades previously - and yet gets no mention? I think it seems quite likely that the roots of the investiture of Jesus with the divine NAME by his followers was rooted in the actions (and possibly even sayings) of Jesus himself. So how did early Christians like Paul go into synagogues, tell Jews that their God was a recently executed criminal that they should worship , and not get stoned to death as blaspheming idolators? particular need for a trial. About the Talmud, I didn't mean to say that I thought that Talmud sayings about Jesus are proof that some Jews contemporary with Jesus wanted him (Jesus) dead. I only meant to say that the death of Jesus was polarizing in the sense that afterward, his death had to be assigned a meaning. The Christians decided early that the meaning was salvific atonement, and yes I agree with you, much later, in response to Christian teaching, some Rabbis would assert that Jesus was a sorcerer/false prophet and met his death appropriately. However, I think we must keep an open mind and maintain some awareness about the manner in which the tumultuous and often unstable nature of politics from the Hasmonean period forward could generate treachery, and unfortunately, pit Jew against fellow Jew. One thinks, in that regard, of Alexander Jannaeus crucifixion of the 800 Jewish rebels, and his mass execution of some Pharisees. We can see that religious/political disputes could lead to violence. There is also the martyrdom of Stephen to consider, the execution of James the apostle, and later, the stoning of James, half-brother of Jesus. These deaths resulted from persecutions by Jewish authorities in Jerusalem, more than suggesting that Jesus himself could have had some opposition among a certain faction that wouldn't have minded seeing him eliminated. And we don't want to forget John the Baptist. From John's execution forward, I think Jesus was always aware that he too could be arrested and executed. What is less clear to me is the extent to which, by his actions and preaching, Jesus escalated the factors contributing to his death. "I glorify Jesus Christ, the God who made you so wise, for I observed that you are established in an unshakable faith, having been nailed, as it were, to the cross of the Lord Jesus Christ in both body and spirit, and firmly established in love by the blood of Christ, totally convinced with regard to our Lord that he is truly of the family of David with respect to human descent, Son of God with respect to the Divine will and power, truly born of a virgin, baptized by John in order that all righteousness might be fulfilled by him." Assertions don't amount to evidence, arguments from silence are of relatively little value in historical inquiry. For example, if one were to read my blog, one would have no evidence that I'm aware of the Reagan presidency or with Clinton's. It would be, however, shoddy history for someone hundreds of years later to claim that I have not heard of those events. What evidence, other than the arguments from silence, do you have to corroborate your assertion that Clement and Paul had no notion of Jesus' baptism by John? Because if Clement had any knowledge that his Lord and Saviour had been connected with somebody like John the Baptist, he would not have gone on about Elijah, Elisha, and Ezekiel and left out John the Baptist as somebody who had prophesied the coming of the Messiah. But please provide evidence that Paul and Clement had the slightest knowledge that Jesus had allegedly been baptised by John the Baptist. Of course, Clement wrote before Ignatius which is why you provide later documents as evidence that the earlier documents do not provide. It seems to be a general rule in Biblical scholarship that if you want to know what was attested early, then the later documents should be given more weight than the earlier ones. Honestly, Carr, I see this as a non sequitur. We simply don't know what a historical person would have done (or wouldn't have done), if they knew this or that. What I've been trying to show the whole time is that it seems that (almost?) everyone knows about Jesus' baptism (with the possible exceptions of Paul and Clement). The doubts I have regarding the ignorance to the matter mainly surround the fact that they knew people who knew people who new people that knew about Jesus' baptism by John. Perhaps it didn't come up. But I think its more probable that it did than it didn't, especially given the paucity of evidence from silence that you have presented. If strands in Q or whatever you like to call it - the earliest oral traditions about Jesus - contain his baptism (a fact that is (nearly?) universally accepted amongst Jesus scholars (regardless of their theological commitments) and if it's also in Ignatius' writings, and if (as you hold) Clement's audience would have expected a reference to Jesus' baptism, it seems most probably that Clement would also have known about it. In addition, the fact that baptism in the earliest Christianity was something peculiar to the presentation we have in the Gospels of John's baptism (the one Jesus is also said to have undergone) argues strongly for this peculiar rite to be tied to Jesus. It is also plausible that Jesus' own baptism is implicitly tied to the references to a Christian's baptism that shows up in most of early Christian literature, especially throughout Paul. It seems to me that you have an unwarranted level of extreme skepticism when it comes to the documents of early Christianity. Just because someone does not mention something, even when we would have expected it, does not mean they were unaware of this or that tradition. All it really means is that they didn't mention it when we thought they would have. I wonder what people would say thousands of years from now, if they looked through your inbox (or mine), or even if they read this exchange, what would they assume we didn't know. Perhaps they would be right about some times, but surely they would be dead wrong about others. BTW - Q doesn't necessarily carry as much weight as, say, an event loosely attested in both M and L.
"Jesus is Lord" which means "Jesus is YHWH"
Erm, no, not necessarily. There is plenty of discussion on this. I agree with you that the death of Jesus had a polarizing effect on relations between Jews and the early followers of Jesus and then the later Christians. False accusations against Jewish leaders, if that was the case, would have contributed to this. Later rabbinic tradition seems to have assumed (and I can't stress this enough that it was an assumption) that if Christians alleged Jews had a role in Jesus' death, then it must be true, and then the rabbis proceeded to reason from this assumption. I cannot agree with what you said about possible Jewish involvement in Jesus' death. Some of the internal Jewish violence you mentioned are from several generations before Jesus. By the 1st century CE, this had ceased. And even in the previous era, you gave an example of a Jewish king persecuting some Pharisees. He did not turn these people over to gentiles or pagans, such as the Romans or a Greek king. Remember that this is what is alleged in Jesus' case — that Jews cooperated with Romans in his death. No examples from Josephus confirm such a thing. Josephus makes it pretty clear that Jewish leaders would never help Romans in this way. In one example, Jewish leaders refused to turn over some Jewish "troublemakers" to the procurator Gessius Florus who made this demand. Josephus also presents Jewish leaders begging Jews not to pursue an action that might upset Rome. But they never arrest or even threaten to arrest anyone. They let Rome take care of their own problems and never help in any way whatsoever. As for examples of Jewish leaders going after Jacob, the brother of Jesus, and Stephen, there is another possible explanation for this. If Jewish leaders were falsely accused of complicity in the death of Jesus, then they would have punished them for libel and not for unusual religious opinions. The Pharisees were very opposed to the death penalty for libel and would have fought the Sadduceean priests every step of the way on this (as happens twice in Acts, in Chs. 5 and 23). Josephus' passage on the death of the brother of Jesus has clearly been altered. He relates this to make the point that the Sadducees were overly severe in punishment. But this point can only be made if we know what Jacob/James did. Josephus must have originally told us the reason for the high priest going after him, otherwise the claim of harshness in punishment makes no sense. So some ancient cleric must have removed the reason Josephus gave. If the reason was that Jacob was falsely accusing Jewish leaders of participating in his brother's death, then that would explain why his writing was altered. But overall, the record in Josephus is clear. Jewish leaders absolutely did not help Rome to dispose of Jewish troublemakers. It would have been abhorrent to them to do such a thing. Jewish involvement in the death of Jesus is theology. It is not history and it is not well-supported in the Gospels either.